Compression spring or springs between balls can also act as torsion spring(s) - providing both initial linear + axial angular momentum. To avoid inducing reaction forces between balls and mounting pins, such coil springs should be double helix construction. Conical friction cups attached to spring ends could provide the necessary coupling to transfer torque to balls during acceleration phase, yet allow ready detachment at end of such phase. Subsequent induction of transverse angular momentum when moving through 'tunnels' will follow. Of course gyroscopic precessional effects would need accounting for but that should not be too difficult. I have finally got around to refuting Richard Gill's latest misguided arguments against my proposed macroscopic experiment: http://arxiv.org/abs/1501.03393. While reading this it is worth remembering that this man calls himself a "mathematician." He often complains that I call him "algebraically challenged." But even after I have repeatedly made him aware, for over 40 days, that his latest preprint contains schoolboy howlers, he has not been able to spot them himself and correct them. For those not familiar with my work (or not wanting to read my arXiv reply to Gill), let me summarize the elementary conceptual mistake Gill and other Bell devotees have been making for the past 50 years. Let the four numbers A, A’, B, and B’ take binary values +1 or -1, and consider the four averages, <AB>, <AB’>, <A’B>, and <A’B’>. These four averages happen to be of physical interest in the actual EPR-Bohm type experiments. cannot exceed the value 2, simply because if B + B’ = 2 then B – B’ = 0, and vice versa. also cannot exceed the value 2. <AB> + <AB’> + <A’B> - <A’B’> . To be sure, average of sum = sum of averages assumption is fine when all A, A', B, and B' are on equal footing (or are standardized variables), but not at all fine within the context of the EPR-Bohm type experiments involving spin measurements about different directions in the physical space. This is essentially the point brought out is some detail in the above reply to Gill. He and other Bell devotees have simply failed to understand the physics and 3D geometry involved in any such experiment: http://arxiv.org/pdf/1501.03393.pdf. Moreover, it so happens that in almost every single physical experiment Bell has been proven wrong. The absolute value of the above string of averages has been shown in many experiments to exceed the value 2. But the Bell devotees like Gill do not take this experimental verdict on face value and accept that Bell has been proven wrong. Rather, they see the experimental refutation of Bell as a vindication of their belief that there is voodoo in the world, whereby our actions here may have instantaneous reactions at the remote parts of the universe. Well, the proposed macroscopic experiment discussed above aims to rectify this sad state of affairs. Here is a very nice blog-post about my work on Bell by Paul Snively: http://psnively.github.io/blog/2015/01/22/Fallacy/. It is good to know that there are knowledgeable people out there who are able to follow my logic: http://psnively.github.io/blog/2015/01/ ... 1814232555. It is also interesting to note that those who claim not to follow my logic, or find faults with my work, are invariably people with substantive vested interests. Unfortunately bits of it are of poor audio-visual quality, but sufficient to get across Unruh's main argument. 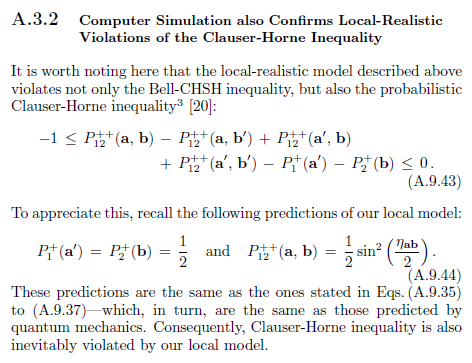 That QM is local despite violating the inequality as predicted by QM. That classical physics strictly obeys the Bell inequality (as opposed to Joy Christian's take on it), and the non-locality and/or non-realism assumptions stemming from Bell's theorem fails not because of any exotic 7-sphere physics, or weird non-locality, but because of a glaring failure to properly interpret the basic math of the theorem. He strongly ties it to superposition and measurement uncertainty - commuting vs non-commuting variables. I have no horse in this race and certainly have not studied it enough to have any definite conclusion of my own. Maybe though the experts here would care to comment on Unruh's approach. He seems to have gone quiet on the topic since that lecture, and in fact has links to pro non-locality articles on his UBC website - but that may not mean much. The Unruh lecture you mention has already been discussed elsewhere in this forum: viewtopic.php?f=6&t=82#p3493. Thanks for that link to past discussion Joy. I will admit to not having looked through more than a fraction of the many past and sometimes very long posts! OK so evidently the gist there is that Bill Unruh is wrong in claiming standard QM is really local. It's a shock for me to now realize you have all along been claiming standard QM is inherently non-local, but since reality is local, therefore wrong. instead I thought your argument was QM made all the right predictions but as an actually local theory. Got that much right? Assuming so, do you agree with my last post in respect of that your theory predicts classical correlations of equal strength to QM, on the basis of a physically real torsion? Such torsion manifesting as in-vacuo chirality in our 'usual' spatial 3D? Q-reeus wrote: Thanks for that link to past discussion Joy. I will admit to not having looked through more than a fraction of the many past and sometimes very long posts! I wouldn't say quantum mechanics is "wrong" (and I don't think you meant to say that either). Quantum mechanics makes all the right statistical predictions, but as an intrinsically non-local theory, provided we accept it to be a "complete" theory of nature. This was essentially the point Einstein fought for most of his life. Einstein was right about this and Unruh is wrong. Bell, by the way, was on Einstein's side on this point. He too agreed that quantum mechanics is an intrinsically non-local theory of nature (provided we accept...). But unlike Einstein Bell thought that no local theory can reproduce all of the statistical predictions of quantum mechanics. And on this point I disagree with Bell and with most of the mainstream physics community: http://libertesphilosophica.info/blog/o ... lations-2/. So, yes, I agree with your observation about the significance of torsion in the physical space for the existence of strong (i.e., quantum) correlations in nature. Allright so agreed QM makes the correct predictions - despite it's presumably wrong inherent non-local formulation. I'm feeling slightly dizzy at this point and obviously have never grasped the subtleties of ontological vs epistemic..... Well hopefully the acid test is not far off. How is the experimentalist team coming along? Converging rapidly to a final physical experimental regime? I like to think my own input this thread has helped in some small way. Q-reeus wrote: Allright so agreed QM makes the correct predictions - despite it's presumably wrong inherent non-local formulation. I'm feeling slightly dizzy at this point and obviously have never grasped the subtleties of ontological vs epistemic..... Well hopefully the acid test is not far off. How is the experimentalist team coming along? Converging rapidly to a final physical experimental regime? I like to think my own input this thread has helped in some small way. Yes, your input was helpful. The progress is slow, however, because of the complexities of the problem (as we discussed before). We just have to hope for the best.